CAA seeks nominations and self-nominations from an architectural historian or an art historian with a specialization in Islamic, East Asian, or contemporary art to serve on the jury for the Millard Meiss Publication Fund for a four-year term, ending on June 30, 2018. Candidates must be actively publishing scholars with demonstrated seniority and achievement; institutional affiliation is not required. The Meiss jury awards subsidies to support the publication of book-length scholarly manuscripts in the history of art and related subjects. Members review manuscripts and grant applications twice a year and meet in New York in the spring and fall to select the awardees. CAA reimburses jury members for travel and lodging expenses in accordance with its travel policy. Candidates must be current CAA members and should not be serving on another CAA editorial board or committee. Jury members may not themselves apply for a grant in this program during their term of service. Nominators should ascertain their nominee’s willingness to serve before submitting a name; self-nominations are also welcome. Please send a letter describing your interest in and qualifications for appointment, a CV, and contact information to: Millard Meiss Publication Fund Jury, College Art Association, 50 Broadway, 21st Floor, New York, NY 10004; or send all materials as email attachments to Alex Gershuny, CAA editorial manager. Deadline: July 22, 2014. This week, Aufderheide and Jaszi completed the last of ten discussion group meetings held over the past few weeks in New York, Dallas, Washington, D.C., Chicago and Los Angeles, in which visual arts professionals explored various situations where fair use can be invoked when using third-party materials and images. Each discussion group consisted of ten to twelve artists, art historians, museum directors, curators, and editors, who were presented with hypothetical scenarios based on the Issues Report. The ensuing discussions have been intense and extremely valuable, providing insights into broadly shared standards for relying on fair use when using copyrighted material. In the third phase of the project Aufderheide and Jaszi will use the results of the discussion groups to synthesize a code of best practices. A preliminary draft will be reviewed by the Task Force on Fair Use, the Committee on Intellectual Property, the project advisors, and a Legal Advisory Committee before a final version is presented to the CAA Board of Directors for approval. CAA is pleased to announce the appointment of new advisors to the Fair Use Initiative. Chris Sundt, Editor, Visual Resources: An International Journal of Documentation and past chair of the CAA Committee on Intellectual Property; and Paul Catanese, Director of Interdisciplinary Arts & Media MFA Program, Columbia College Chicago and past chair of the CAA New Media Caucus have agreed to serve in this capacity. The advisors will contribute to the review of the draft code, propose possible candidates for the legal review committee and assist in the dissemination of the code once the CAA Board of Directors has approved it. A report on the Fair Use Initiative will be presented at the Annual Conference in New York in February 2015. The president of CAA’s Board of Directors, DeWitt Godfrey, has made appointments to the editorial boards of CAA’s three scholarly journals, in consultation with the editorial boards and the vice president for publications, Suzanne Preston Blier. The appointments take effect on July 1, 2014. Two new members-at-large have joined the Art Journal Editorial Board. Tirza True Latimer is an associate professor at the California College of the Arts in San Francisco and chair of its graduate program in visual and critical studies. Janet Kraynak is an associate professor of contemporary art history at the New School in New York, with joint appointment at Parsons the New School for Design and Eugene Lang College. The terms for Latimer and Kraynak extend until June 30, 2018. The Art Bulletin has announced its next reviews editor: Nancy Um, associate professor in the Department of Art History at Binghamton University, State University of New York, and a scholar of Islamic art and visual culture. For the past year, Um has been a scholar in residence at the Getty Research Institute in Los Angeles. From 2011 to 2014, she served as the inaugural reviews editor of the International Journal of Islamic Architecture. Um is the author of The Merchant Houses of Mocha: Trade and Architecture in an Indian Ocean Port (University of Washington Press, 2009), as well as many essays and book chapters. Um will succeed Rachael DeLue of Princeton University, beginning a three-year-term as reviews editor on July 1, 2015, with the preceding year as reviews editor designate. The caa.reviews Editorial Board welcomes two new members-at-large: Meredith Cohen and Suzanne Hudson. Cohen is a historian of the art, architecture, and urbanism of medieval Europe and an assistant professor of art history at the University of California, Los Angeles. Hudson is an assistant professor of art history and fine arts at the University of Southern California in Los Angeles and currently serves as the caa.reviews field editor for exhibitions of modern and contemporary art on the West Coast. Both Cohen and Hudson will serve four-year terms on the editorial board, from July 1, 2014, to June 30, 2018. The caa.reviews Council of Field Editors has four new members. Phillip Bloom, an assistant professor of art history at the University of Indiana in Bloomington and a visiting researcher at the Institute for Advanced Studies on Asia at the University of Tokyo for 2013–14, will commission reviews of books on Chinese art. Edward A. Vazquez, assistant professor of history of art and architecture at Middlebury College in Vermont, will be the field editor for exhibitions of modern and contemporary art in the northeastern United States. Megan Cifarelli, an associate professor at Manhattanville College in Purchase, New York, and chair of her school’s program in art history, will assign reviews of books on ancient Egyptian and Near Eastern art for the journal. Finally, Pamela M. Fletcher, a professor of art history and codirector of the Digital and Computational Studies Initiative at Bowdoin College in Brunswick, Maine, joins caa.reviews to oversee reviews of digital projects in the visual arts. Lisa Ficarelli-Halpern. Visual Arts Center of New Jersey, Mitzi and Warren Eisenberg Gallery, Summit, New Jersey, May 9–June 29, 2014. #BaroqueTechStyle: Portraits by Lisa Ficarelli-Halpern. Oil painting and digital printmaking. Michelle Handelman. Eastern State Penitentiary, Philadelphia, Pennsylvania, May 9–November 16, 2014. Beware the Lily Law. Installation. Victoria Fu. Document, Chicago, Illinois, January 31–March 8, 2014. Crossbar Radical-Tick Scoop Star. Installation, video, projection, and photography. Victoria Fu. Simon Preston Gallery, New York, May 4–June 7, 2014. Belle Captive. Installation, video, projection, and photography. Sue Karnet. BBLA Gallery, Bohemian Benevolent and Literary Association, New York, April 2–29, 2014. Perceptions. Painting. Lorna Ritz. French Cultural Center, Boston, Massachusetts, March 1–31, 2014. A Travelogue in Color. Painting. Jo Sandman. Gallery Kayafas, Boston, Massachusetts, April 18–May 24, 2014. Transmissions. Transparent images. Leigh Tarentino. Mixed Greens Gallery, New York, March 20–May 23, 2014. The Night Hours. Window installation. Wynne Greenwood. Henry Art Gallery, University of Washington, Seattle, Washington, April 5–June 15, 2014. Wynne Greenwood: Notes on Tracy + the Plastics. Video archive. CAA endorses the Association of Art Museum Directors sanction against the Delaware Art Museum for selling an object from their permanent collection to address financial challenges. 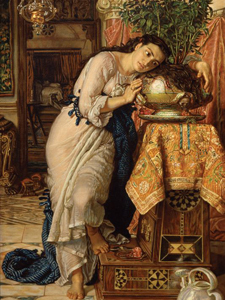 The work in question is William Holman Hunt’s Isabella and the Pot of Basil (1868) sold at Christie’s this week for a final hammer price of $4.25 million, half the amount estimated. The sanction will result in the Delaware Art Museum not receiving loans of works of art from the AAMD member museums: http://galleristny.com/2014/06/aamd-sanctions-delaware-art-museum/. This sale is unethical and a breach of fiduciary responsibility according to the collection policies of Association of American Museums, AAMD and CAA. Museum collections are held in the public trust, and proceeds of sales of works from permanent collections are to be used for future growth of collections. Enhance utilization of digital capabilities by journal authors and promote digital expertise. The directors are grateful to the Strategic Planning Task Force chaired by president emerita Anne Collins Goodyear and all the members who contributed to the development of this new plan. The directors gratefully approved the endowment gift by Mary Douglas Edwards of $50,000 to support travel and registration to attend the CAA annual conference by women who are emerging scholars pursuing a doctoral degree or who have received their Ph.D. within two years prior to the submission of the application for the award of the grant and who will present research papers at an art history session at the conference with strong preference for papers on any topic pertaining to the art of ancient Greece or Rome, Medieval Europe from 400 – 1400, or Europe and North American from 1400 – 1950. The directors approved the IRS Form 990 for Fiscal Year Ended June 30, 2013. The directors approved CAA joining the Partner Program of the Society of Architectural Historians. The directors also approved the Resolution to commend the Women’s Art Journal requested by the Committee on Women in the Arts for the maintenance of high quality scholarship that serves as a forum for re-examining feminist concerns of the women’s art movement. A letter of commendation was sent to Joan Marter, Professor of Art History, Rutgers University and Editor, Women’s Art Journal. The directors established a Task Force on Design, chaired by Debra Riley Parr, , to investigate and make recommendations to the directors on 1) tenure and promotion standards for designers; 2) CV guidelines for designers; 3) representation of design fields in all the professional committees; and 4) scheduling sessions at the annual conference on design issues. The directors decided to evaluate the Professional- Development Fellowships in Art History and Visual Arts in light of the current job market and in the context of the Strategic Plan 2015-2020 and to temporarily suspend the program. A Study Shows How Audiences Are Changing, but Should Data Guide Artistic Decisions? caa.reviews recently published the authors and titles of doctoral dissertations in art history and visual studies—both completed and in progress—from American and Canadian institutions for calendar year 2013. You may browse by listing date or by subject matter. Each entry identifies the student’s name, dissertation title, school, and advisor. Each institution granting the PhD in art history and/or visual studies submits dissertation titles once a year to CAA for publication. The caa.reviews list also includes dissertations completed and in progress between 2002 and 2012, making basic information about their topics available through web searches. Shiben Banerji has joined the Department of Art History, Theory, and Criticism at the School of the Art Institute of Chicago in Illinois as assistant professor of history of architecture. Emine Fetvaci, an associate professor of Islamic art, has earned tenure in the Department of History of Art and Architecture at Boston University in Massachusetts. Patrick Hajovsky, an assistant professor of art history who specializes in Precolumbian and colonial Latin American art, has earned tenure in the Art and Art History Department at Southwestern University in Georgetown, Texas. Seth Kim-Cohen has been appointed assistant professor of contemporary art history in the Department of Art History, Theory, and Criticism at the School of the Art Institute of Chicago in Illinois. Elena FitzPatrick Sifford has accepted the position of assistant professor of Renaissance and Baroque art at Louisiana State University in Baton Rouge. Mechtild Widrich has joined the Department of Art History, Theory, and Criticism at the School of the Art Institute of Chicago in Illinois as assistant professor of contemporary art history. Gregory Williams, associate professor of contemporary art at Boston University in Massachusetts, has received tenure in his school’s Department of History of Art and Architecture. Paul R. Davis, previously Andrew W. Mellon Postdoctoral Fellow at the Centre for the Creative Arts of Africa at the University of the Witwatersrand in Johannesburg, South Africa, has been appointed curator of collections at the Menil Collection in Houston, Texas. Douglas Dreishpoon has become the first chief curator emeritus at the Albright-Knox Art Gallery in Buffalo, New York, where he has worked since 1998. Christine Neilsen, formerly assistant curator of late antique and Byzantine art for the Art Institute of Chicago in Illinois, has been named William and Lia Poorvu Curator of the Collection and Director of Program Planning at the Isabella Stewart Gardner Museum in Boston, Massachusetts. David Odo has left his position as Bradley Assistant Curator of Academic Affairsat the Yale University Art Gallery in New Haven, Connecticut. He is now director of student programs and research curator of university collections initiatives at the Harvard Art Museums in Cambridge, Massachusetts. Brandon Ruud, previously curator of American art for the Sheldon Museum of Art at the University of Nebraska in Lincoln, has been named the new Constance and Dudley J. Godfrey Jr. Curator of American Art and Decorative Arts at the Milwaukee Art Museum in Wisconsin. Jill Shaw, a research associate at the Art Institute of Chicago in Illinois, has accepted the position of senior curator of collections at Colgate University’s Picker Art Gallery in Hamilton, New York. Parme Giuntini, professor of art history and assistant chair of liberal arts and sciences at Otis College of Art and Design in Los Angeles, California, has become a contributing editor to the website Art History Teaching Resources. Kimberly James Overdevest, assistant professor of visual arts at Grand Rapids Community College in Michigan, has joined the website Art History Teaching Resources as a contributing editor. Virginia Spivey, an independent art historian based in Washington, DC, has become a contributing editor to the website Art History Teaching Resources.